SÃO PAULO, Brazil — The end of the world has already arrived in Brazil. At least that’s what people here are saying. A constitutional amendment passed by the Senate last month is being called “the end of the world” amendment by its opponents. Why? Because the consequences of the amendment look disastrous — and long lasting. It will impose a 20-year cap on all federal spending, including education and health care. The government justified the measure on the grounds that Brazil faces severe budget shortfalls. But the people aren’t buying it. A poll last month found that only 24 percent of the population supports the amendment. Brazilians took to the streets to express their disapproval. They were, as usual, met with tear gas and mounted police officers. High school students occupied as many as 1,000 schools in protest, many in the southern state of Paraná. The government isn’t backing down. The “end of the world” amendment is just one of many neoliberal measures being pushed through by Michel Temer, the president. It should be cause for concern that Mr. Temer can undertake so many such reforms, especially considering most of them, including the budget cap, go against the agenda of the person who — unlike Mr. Temer — was actually elected president. Last August, President Dilma Rousseff of the Workers’ Party was removed from office over allegations that she had manipulated the state budget. As soon as Mr. Temer, who had been Ms. Rousseff’s vice president, took office, he announced a series of neoliberal policies. He’s still at it, saying he’s taking advantage of his unpopularity to put unpopular measures in place. Mr. Alston added that the law would place Brazil in a “socially retrogressive category all of its own.” Which seems exactly where Mr. Temer and his allies want us to be. In addition to the spending cap, Mr. Temer has introduced a proposal to revamp Brazil’s pension system. His proposal will set a minimum retirement age of 65, in a country where the average person retires at 54. The law will also require at least 25 years of contributions to the social security system by both men and women. There are good reasons Brazil hasn’t passed laws like this before. Although the average life expectancy in Brazil is 74, we’re one of the most unequal countries in the world. For example, in 37 percent of the neighborhoods of the city of São Paulo, people have a life expectancy of less than 65 years. It’s even shorter for the rural poor. Some of Mr. Temer’s economic plans don’t even have to do with the budget deficit. Also last month, shortly after the budget cap passed, the government proposed a labor bill that would allow deals between employers and trade unions to prevail over the labor laws. The new proposal also increases the maximum permitted working hours to 12 per day and reduces regulations on the employment of temporary workers. The business community has praised the plan. Labor unions are enraged. Another priority of the Temer presidency is what’s known as the outsourcing bill. It was first proposed in 2004, but never passed because of strong labor union resistance. In April 2015, it was ratified by the lower house of Congress and is now awaiting consideration by the Senate. The bill would free companies to contract out any job to third parties, even from their core business. Under current rules, companies can outsource only “nonessential” jobs like janitorial positions, while “essential” workers have to be hired directly by the company, which means they are entitled to all the rights and benefits prescribed by law, such as paid vacation, maternity leave and year-end bonuses. Given all of this, it shouldn’t be surprising that the Temer administration is deeply unpopular: a poll in December found that 51 percent of Brazilians rated it “bad” or “terrible.” (Only 10 percent of respondents said they approve of the government. Thirty-four percent called it “regular.”) Mr. Temer, who took power thanks to Ms. Rousseff’s impeachment, has also been found guilty of violating campaign finance limits and has been named in one of the many corruption scandals unfolding in the country. 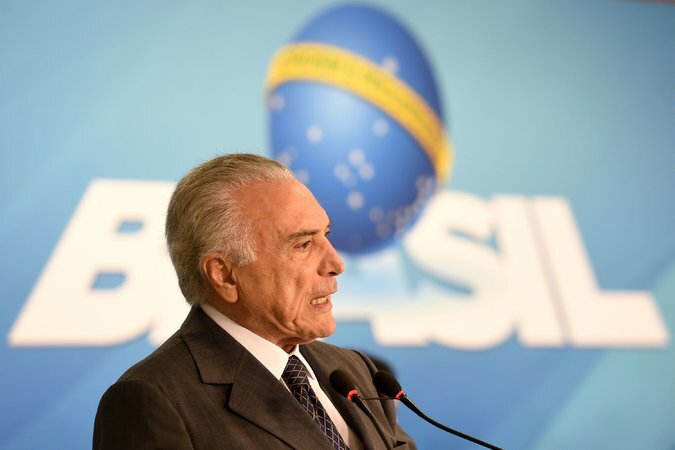 Nevertheless, the new government has already received full support from the following organizations: Brazilian Federation of Banks, the Agricultural Parliamentary Front, National Confederation of Industry, the World Trade Organization, the Federation of Industries of the State of São Paulo, Federation of Industries of the State of Rio de Janeiro, Brazilian Chamber of Construction Industry, National Federation of Motor Vehicle Distributors and several top executives. For some Brazilians, at least, the end of the world is the beginning of a golden opportunity. A version of this op-ed appears in print on January 6, 2017, on Page A9 of the New York edition with the headline: Brazil’s austerity apocalypse.